You must make reservations at least 5 minutes in advance of the time at Red Brick Station. Parking is available at the Avenue. Welcome to Red Brick Station at White Marsh Brewing Company located at the Avenue in White Marsh! 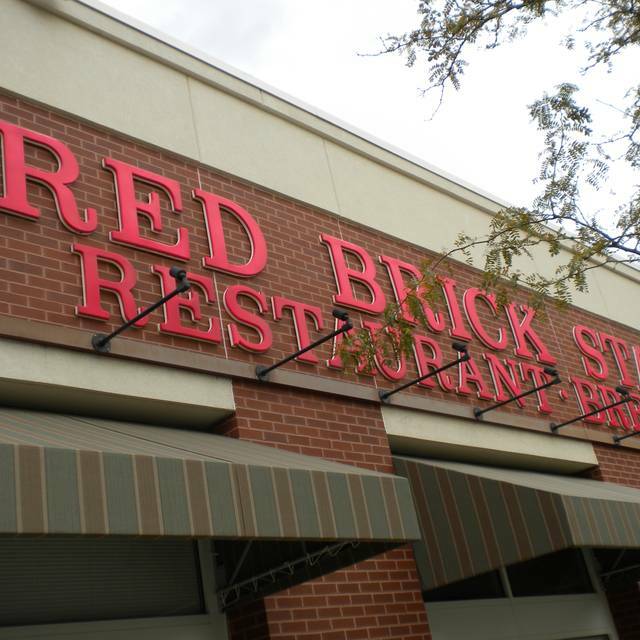 We have designed and built Red Brick Station as a place where you will want to dine and socialize often. Along with our dining room and two patios our bar area features room for 80+ customers on a first come first serve basis. There are seats available at the bar and we feature both high and low tops on the outside area of the bar. Unlike many chain restaurants, we are independently owned and operated, so we can make changes to our menu and operations quickly to meet your needs. We use all fresh ingredients to bring the freshest foods to your plate. Be sure to check out our latest made in house beer selections and be sure to call us at 410-931-7827 for carry out and reservations! Thank you for choosing Red Brick Station. P.S Our new menu has just recently been released! Crispy tater tots topped w/ our signature crab dip, bacon & melted cheddar jack cheese - big enough for two! ask your server what we're pouring! Great food, relaxing atmosphere. Justin was our waiter and is terrific!!! We have found ourselves coming back several times in recent months. The food has been very good each visit and the atmosphere is open and pleasant. Prices are slightly higher than some of our other go to spots but within reason. Would highly recommend anyone to give it a try. It was very busy on the bar side which inundated the servers, ultimately causing longer than normal voids in between service. Overall...still pretty good service. The food and the service was awesome! Absolutely one of the best dining experiences we have ever had. It was our 10th anniversary and this was the place we had our first date. The managers guaranteed out same table from first date, bought us champagne and desert. I have never had a better more attended to feeling in ANY RESTAURANT and I do not say that lightly. These people went way beyond my expectations and they have my loyalty for sure. The service was excellent and the food and drink was top notch. Both managers and the owner stopped by to chat and ask if there was anything they could do for us. Hard to impress this 57 year old who has eaten at 1000's of restaurants and this was by far the best customer service i have ever received. I never had a bad experience at RBS. Food always good service is prompt without server being a pest. The food was okay... nothing special. Good bar food. Our server was excellent. she was fast funny and friendly. Most of us had wings and the bay salad. We were all pleased. They congradulated me on planning an excellent evening. Thanks to all at Red Brick for making it happen. We were even moved to much better seatin where we all had space and were comfortable. Baby back ribs were delicious. Meat fell off the bones! Our table waiting readu and waiting for us when we arrived. The service was impeccable. She took our drink order as soon as we sat down. Our food orders were all correct and brought out in a timely manner, and she even accommodated some extra needs. The food was great ! It was a pleasant and positive experience. We had a part of 11 for lunch. Called ahead and they had us ready 45 min ahead of time. Excellent service. Good food. Some of us selected the restaurant week menu, would have preferred more than 1 choice for dessert. Good food, server was friendly and helpful and we had a nice time. Ordered the Maryland Pasta shrimp was undercooked but overall nice experience. Went for a weekend lunch. Very good food. It's a comfortable place convenient to shopping along The Avenue. My friend ordered the French onion soup and when they brought it out, it looked so good I ordered one, and they brought mine very quickly. I also loved my generously portioned salad with chicken and shrimp. Our waiter was excellent. Great service and food. I will be back! I’ve been to a Red Brick intermittently over the past 10 years and have always sat in the bar area. However, this was the first time I planned on being there on a Friday night so I made a reservation. Sure enough it was crowded but still managed to get a seat in the bar area. Suffice it to say, this place is like Cheers. The bar tending staff is fantastic. You get friendly, funny, fast attentive service. Quite often you’re sitting next to some very nice customers who are also enjoying their experience. This is a great neighborhood establishment with an excellent choice of beers, tasty food, but most significantly an exceptional staff will make sure you have what you need to fully enjoy your meal and your time there. Had a family Holiday get together and everyone liked what they picked to eat. The service was great ( made reservations and was ready right on time ), food was also very good. We sat in the tabled dining area and they had issues with the ceiling lighting ( sections were flashing like a strobe light and was very annoying until it settled down ), staff didn't seem concerned so I'm thinking it's happened before. I made a reservation 4 days in advance for our group of 9. When we arrived the restaurant was quiet and the overall apearance seemed untidy. Our table was not completely set with missing silverware of which we had to make our server aware of after our food arrived. Our server was attentive, accomodating and polite but the food seemed bland but ok. Unfortunately it is the nearest middlepoint for a bunch of us to have a yearly get together, else I would probably try a new place. This was my first time going. The service was excellent. Although it was busy (Friday night) the food came out hot and fast. Been going to RBS since it open....great place and they value their customers. Beer is very good!! We haven’t been to this restaurant in a couple of years hoping they would have made some changes. It’s in need of a major renovation inside. The inside is laid out horribly, almost like you’re eating in a cafeteria. Tables are crowded together and all you can hear is a bunch of people talking. Absolutely no ambience whatsoever. Carpets are worn and dirty, in desperate need of replacement. The decor is old and outdated. Even the mirrors on the walls look tired! The food was bland. The nachos were dry and included some cubed chicken that had a rubbery consistency. We used to enjoy the Three Pint Pasta when they first opened, which was ages ago, but it now tastes like cream with curry powder stirred in. Terrible! I usually don’t review restaurants but felt like I may save a few people from the same disappoint my wife and I had. Too many other new choices close by than to waste your money eating in a place with bad food and terrible atmosphere. Hope the owners consider putting some money back into their business. I certainly won’t be going back. Love that it’s right behind the movie theatre. Parking is crazy at this strip mall though. This is the second time I’ve went to Red Brick Station and it did not disappoint. Our server was very kind and attentive. The crabby tots are so delicious! Prices are decent too. A nice, non-fussy place with some of your favorite American dishes. Love it! Raven's game gave a little bit more excitement to our dinner! Meal was very good. My salmon had a bit too much sauce. Everything else was great as was our server, Sam! Was our first time there. Had heard good things, so decided to try it out. To be honest, the plan was to take my wife to P F Chang's, but upon looking at their menu, I knew she wouldn't like it, she's a very picky eater. Remembered you guys were in The Avenue as well. Made quick reservations online, the rest is history. Waiter was outstanding. Since it was our first time, he gave us a quick overview of the menu, showing a few of his favorites. Was very attentive. Food was OUT OF THIS WORLD. Wife had the teriyaki tuna, I had the 2 piece fish and chips. Glad I didn't get the 3 piece, I was stuffed!! Tuna steak was on point. I think we're coming back this weekend and bringing the in law's with us. Excellent, excellent resturant. SO glad my original plan didn't work out!! We came to Red Brick Station while on vacation and although we didnt stay in the White Marsh area, we took the drive to Red Brick Station for the great food and beer selections. Good location with plenty to do around there! Did not disappoint ! Town Center area for good comfort food. I love the burgers. My favorite is the Red Brick Burger. I am also a big fan of their Blueberry Ale. It is a seasonal that am anxious for every year. We had a group of 8 for our dinner on Saturday. The service was outstanding. Drinks were great, selection was great, and appetizers were well portioned and very good. Most got salads, and enjoyed them. I ordered the Maryland Pasta, which sounded so amazing. However, it was loaded (very loaded) with garlic. I just cannot handle garlic, let alone that much garlic, so I couldn't eat my meal. The Manager and Server were so understanding. They offered to replace my meal (I declined but was grateful), they did not charge me for it, and were just very nice about it, in general. I was so very appreciative. Definitely a place I would recommend highly. We were in town for a sports tournament. We needed a place for a team meal. On short notice, Red Brick Station was able to accommodate our group of 40 teenage boys and parents even though they had another party of 60 coming in shortly after us. The manager was awesome! The food was excellent. Pricey, but worth it. We had a group of 16 for a birthday get together and our server handled all of us with ease! Considering the size of our group we did not have to wait very long for our food. Food is consistently good. I consider it the best restaurant on The Avenue. Not a stellar place but okay. Didn't really make a real big impression. Way too noisy. We were in the very back of the dining room and it was difficult to hear anyone. 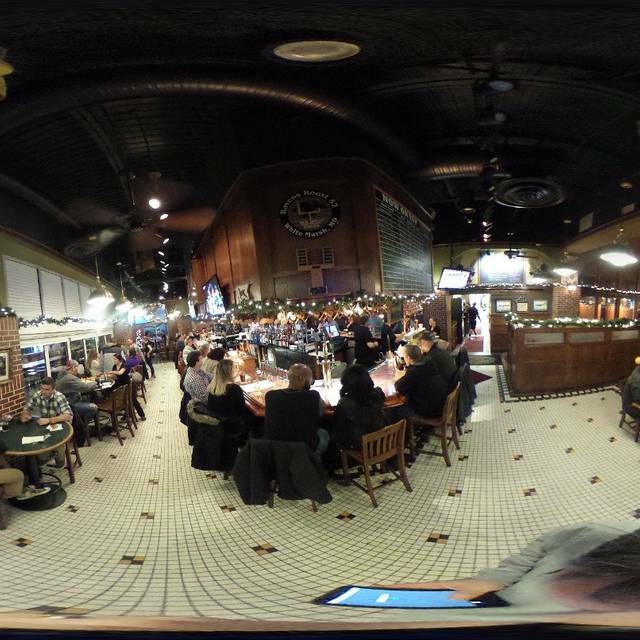 It's great that there are so many who dine at RBS, but don't plan on having a conversation. This was a Tuesday night. Beer - Good, Food - not so much, Service - Good. We appetizer and entrees, maybe the sandwiches or burgers are better. The meals were all drowning in sauce and overcooked. Seems fine for a drink, but not for dinner. First visit at Red Brick Station. Solid pub menu. Will go back for lunch sometime. Convenient to movies and shopping. Plenty of parking. Food was good. IPA was good. New waitress not trained well. But she tried.